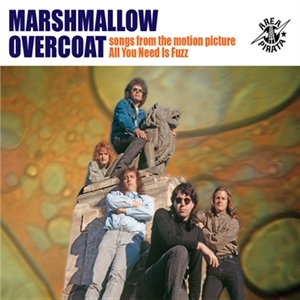 The garage music underground exploded again in the 1980s, and one band - The Marshmallow Overcoat - spread the fuzz and psychedelia from their Tucson, Arizona home for the next three decades. Their improbable paisley-punk journey - and the hopes and struggles of thousands of other bands just like them - are revealed in All You Need Is Fuzz : 30 years in a garage band, the new feature documentary film by director and renowned garage-music expert Timothy Gassen. Area Pirata Records now releases the audio CD Songs From The Motion Picture All You Need Is Fuzz. It features 25 songs from the new documentary feature film, and also serves as a 30-year "best of" collection for the American garage-psych maestros. The deluxe digipak audio CD features three new songs, including the shimmering paisley pop single "Wait For Her", and also features seven songs on CD for the first time. A 56-page pdf book, detailing the 30-year discography and recording history of the band, is also included on the disc. The bands amazing three-decade crusade, made on a perpetual shoestring budget, cemented The Marshmallow Overcoat as one of the longest-running garage bands in the history of rock & roll.